John Patchett is a well-known East Anglian professional artist, who is a member of the East Anglian Institute of Artists and whose pastel paintings are much sought after, both in England and abroad. Born in Deal, Kent in 1946. After attending Grimsby School of Art, Kingston-upon-Thames College of Art and Brighton College of Art, John settled in Australia where he lived for 19 years. In 1994, he returned to this country, settling in East Anglia where he has easy access to some of his favourite locations. Besides holding over 40 successful solo shows in Australia and England, John’s pastel paintings have been exhibited in Japan, New Zealand and with the ‘Pastel Society’, ‘The Royal Society of Marine Artists’ and the ‘Laing Exhibition’ at the Mall Galleries, London, where he was awarded the ‘1997 Guest’s Choice’ prize. 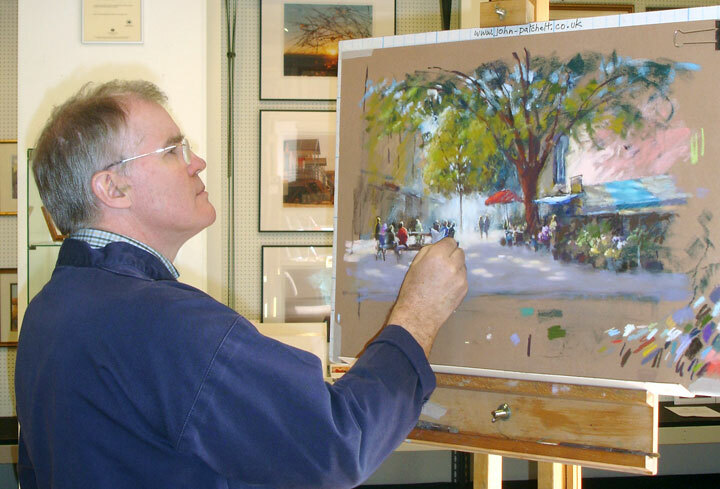 In recent years, John Patchett’s pastel paintings have become a regular feature in articles in the ‘Leisure Painter’ magazine. One of John Patchett’s ‘claim to fame’ is having a photograph, of himself painting at his easel in Norwich market, printed on the box lid of the Norwich edition of the ‘Monopoly’ game! His pastel paintings cover a wide range of subject matter, including East Anglian and French landscapes, cityscapes, Broadland scenes, gardens, sun lit markets, street cafes, marine and coastal locations. ‘Words & Vision’ magazine, No. 17 (Australia) Spring 1984. ‘Art & Artists Year Book’ 1997. ‘International Pastel Artist’ magazine, No. 11 (Sept. /Oct. 2001). ‘Step by Step – Art Course’ magazine No. 78 (Dec 2001). “Painting From The Heart” – A biography written by Adrian Hill. My work sits squarely between the mainstream landscape tradition and English impressionism. As an artist, my senses are stirred by what unfolds before me. Light and shade, glorious cloud formations, shimmering sunshine on the surface of water and bustling crowds silhouetted against the light. My intention is always to distill and interpret the array of emotions and senses and try to give them form in purely visual terms. Although I feel as if I’m having only partial success in this, it is only fully realised when someone else responds to the painting in the same way. I feel all paintings should be treated like royalty and when viewed, should always speak first. The content of most paintings need to be absorbed over a period of time and require an attentive audience, as they contain more than their apparent dimensions may suggest. I have clients who tell me long after purchasing a particular piece of work, that my paintings continue to reveal all manner of things as they make new discoveries within the composition or that the light in the painting appears to change at different times of the day or in different light conditions. For me, painting is not merely a mechanical activity, it is a creative process involving emotions, insight and the fine tuning of ones aesthetic senses. In my work, I attempt to capture light, mood, atmosphere and fleeting moments at different times of the day and times of the year. Painting is like being on part of a journey. I’m never completely sure of when or where I shall arrive, but always sure that the travelling will be both a learning and an absorbing experience, giving me a great deal of unique pleasure along the way. My art is the expression of my senses and I therefore want my art to communicate feelings, which impinges on the viewer’s sensibilities.